Modern BI is all about helping more people easily get more insights from data. This not only requires making analysis and visualization of traditional numerical data easier – it also requires making other types of data accessible to more people for analysis as well. For example, consider trying to understand the key topics of a collection of news articles. This type of activity (be it news, product reviews, or tweets) is a fundamental activity for wide range of business users, but it is rarely supported in business intelligence solutions. Today, we’re excited to release 3 new custom visuals for Power BI. The strippets browser, cluster map, and facet key are designed to help you create Power BI solutions for browsing, understanding, analyzing large collections of text. You can download these custom visuals from the Visuals Gallery. These visuals operate on any kind of tagged document content being visualized in Power BI. This can include key phrases, real-world entities such as people, places, and organizations, or abstract concepts that have been tagged in your data. These visuals make a fantastic pairing with the output of text analysis from the Cortana Analytics suite, but they can also be used to help make basic text content an integrated part of your report. Here’s an example that illustrates their use for news reading, using the likely familiar example of tracking the “hottest” topics in technology. As you can see in this example, by using these visuals in Power BI we’ve made understanding a large feed of news articles quick and highly visual. Let’s take a look at the three new custom visuals used to make this report. Notice the highlighting in the document text? This indicates a reference to a named entity, for example a person, place, or organization. In this example, that entity is the organization “Microsoft”. The first reference to any entity that plays a key role in the story is also accompanied by an icon in an outline strip next to the document scrollbar. Icons are positioned within this strip according to the document locations where the corresponding entities are introduced, and also act as hyperlinks that can automatically scroll the document to these locations. This outline strip, or “strippet”, provides a compact visual summary of the key entities participating in the story as well as an aid to navigation. These strips are also the foundation of the second Strippets Browser mode: the outlines view. 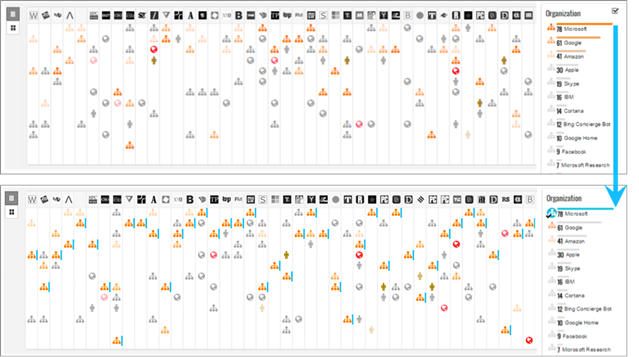 Both views of Strippets Browser use infinite scroll to continuously retrieve new stories on demand. The Cluster Map is a great way to help users navigate a report by providing a visual way to select everything related to a certain topic and quickly browse a large variety of content. The Facet Key is the final piece for putting together a great document analysis report, showing the most frequent entities of various types across an entire document collection. Selecting an entity of interest filters and highlights linked visuals in ways that enable document collections to be analyzed systematically, one entity at a time. An additional benefit of the Facet Key is that it can be used to create and interpret icon mappings in other linked visuals. In this example, the top three entities of each type are assigned a color, where hue represents type (e.g., red locations versus orange organizations) and saturation conveys the rank of that entity (more colorful means more frequent). Icons can also be customized using Font Awesome CSS class names for even more visual awesomeness. All three custom visuals can be used independently or in conjunction with other Power BI visuals. They are designed to be better together, and for structured reading scenarios like the entity-based news reading example described in this blog, but we’re excited to see how you use them to unlock new insights on new types of data!